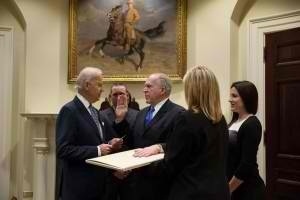 There has been a great deal of buzz surrounding the swearing-in ceremony of John Brennan as director of the CIA during which he took his oath of office with his hand on the original draft of the US Constitution which, most notably, did not include the Bill of Rights. Some see this as quite symbolic given the extreme rejection of the most essential rights by the current administration, most notably the wild interpretation of the concept of due process, the claimed authority to kill Americans even when there is no clear evidence of terrorist activity and the claimed authority to indefinitely detain Americans without charge or trial. “That means, when Brennan vowed to protect and defend the Constitution, he was swearing on one that did not include the First, Fourth, Fifth, or Sixth Amendments — or any of the other Amendments now included in our Constitution,” Marcy Wheeler of Empty Wheel points out. “The Bill of Rights did not become part of our Constitution until 1791, 4 years after the Constitution that Brennan took his oath on. Keep in mind, Brennan is referred to as the chief architect of the Obama administration’s highly contentious open-ended drone program. Wheeler maintains that “these vows always carry a great deal of symbolism” and the White House also “took pains to emphasize the symbolism of the ceremony” according to Oliver Knox. The problem is that he reaffirmed his commitment to a Bill of Rights-free version of the Constitution. “That means: No freedom of speech and of the press, no right to bear arms, no Fourth Amendment ban on ‘unreasonable searches and seizures,’ and no right to a jury trial,” writes Knox. Some bloggers maintain that there is a quite deep meaning behind this ceremony. Others maintain that even if he had taken an oath on a Constitution that includes the Bill of Rights, it wouldn’t stop him from violating it. “Even if Brennan had taken an oath on the Constitution with the Bill of Rights included, does anyone think that would stop him from making a mockery of the document if the president ordered him to?” Rick Moran asks. Others just make passing mention of the symbolism of the document choice. Was this choice pregnant with meaning or are people just reading into it? Let us know on Facebook, Twitter or in the comments section of this post.